Sports Betting: Brett, LeBron, and T.O - Who's in Charge of Building a Championship team? Sports Betting: Brett, LeBron, and T.O - Who's in Charge of Building a Championship team? LeBron James signed a contract to become a member of The Miami Heat, Joining Dwayne Wade and Chris Bosh. His "Decision" to leave The Cleveland Cavalier's have Ohioan's in an uproar, the sports betting community ready to cash in and sparked world debate. Brett Favre, un-retired again, after being influenced by three of his Minnesota Viking teammates to come back for another Super Bowl run. Controversial wide-receiver, Terrell Owens has been hired by the Cincinnati Bengals. Bengal's quarterback Carson Palmer encouraged the teams management to bring Terrell aboard. See the trend??? The sports betting community does. Professional athletes are attempting to do what their bosses can't. Build Championship contending teams. Brett was hungry for another trip to the Super Bowl.The Green Bay Packer's pretty much decided that Aaron Rodgers was their quarterback of the future, and after a so-so NFL schedule with The New York Jets, Favre joined the Viking's and was an interception away from the NFL Predictions 2010 Super Bowl. LeBron, wisely decided after seven years, that the Cavalier's management were unable to provide him with enough talent and support to win an NBA Title. Perhaps T.O., has given up his selfish ways, at the age of 36, to become a team-player and pursue the ultimate goal. Winners like,.... to win! The sports betting world likes it when they do. Many of professional athlete's are taking measures in their own hands to do so, a welcoming trend to the sports betting community. Picture Carson Palmer faking a hand-off to Cedric Benson, the defense bites and receivers Ocho Cinco, T.O. and Antonio Bryant are all running their routes. Ya can't double- team them all! With teammates like Adrian Peterson, Percy Harvin, Sidney Rice, Visanthe Shiancoe, Jarred Allen, and rookie Toby Gehart, why would any quarterback alive, not to mention Brett Favre, would ignore this opportunity? 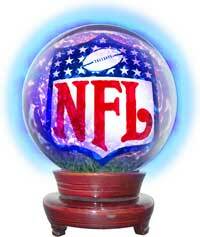 The Minnesota Vikings and the Cincinnati Bengals in the 2011 NFL Predictions Super Bowl? A very strong possibility for your 2010 NFL predictions lineup. The current Vegas line shows Cincinnati is currently at 25-1 odds and Minnesota is 11-1 to win it all. Looking at the NBA Vegas line, LeBron and the Miami Heat have instantly become the NBA odds makers favorites to win the NBA Championship Title. Too many Chief's and not enough Indian's? Brett, LeBron, and T.O. are among the many of the Indian's, that are attempting to do what the Chief's can't. Vegas-spreads.com recommends that you take advantage of the preseason NFL predictions bonuses available at SPORTSBOOK.COM . The NFL odds makers there are offering up a $250 Cash Bonus for you to make your Super Bowl predictions. Also, it's never to early to make your NBA predictions, the time is now to get the best NBA odds on you favorite team.